Summer is here, and with it comes an almost daily need for your air conditioner. You should expect it to work day in and day out without problems, and when trouble arises, you need to get it fixed as quickly as possible. That’s why choosing the right air conditioning service is so important: as important as picking the right mechanic for your car. Here in Los Angeles, air conditioning services need to respond to anything your system might need. With a skilled professional, you can handle not only unexpected repairs, but numerous other services vital to the health of your air conditioner. Here are 3 common types of air conditioning services you should expect from whoever you call, in addition to regular repair and installation services. Maintenance. Maintenance sessions aren’t quite the same as repairs. They’re more of a tune-up, designed to help your air conditioner function more effectively and stop future repairs before they start. The technician cleans off the internal components, recharges refrigerant levels and tightens any loos bolts or screws, then runs the system for 15 or 20 minutes while checking for signs of more serious issues. Planning an annual maintenance session makes a lot of sense, and can spare you the ravages of an unexpected repair session to boot. Upgrades. You can improve your air conditioning systems without necessarily replacing the whole thing. For example, new digital thermostats allow you to turn the air on and off remotely from an app on your phone, while a zone control system lets you turn the air off in certain parts of the house while leaving other parts cool and comfortable. Air filters. All air conditioners come with basic air filters to help keep dust and other detritus form spreading through your home. A good air conditioning service can install a more comprehensive filter system – including one with UV germicidal lights – to keep your family healthy. 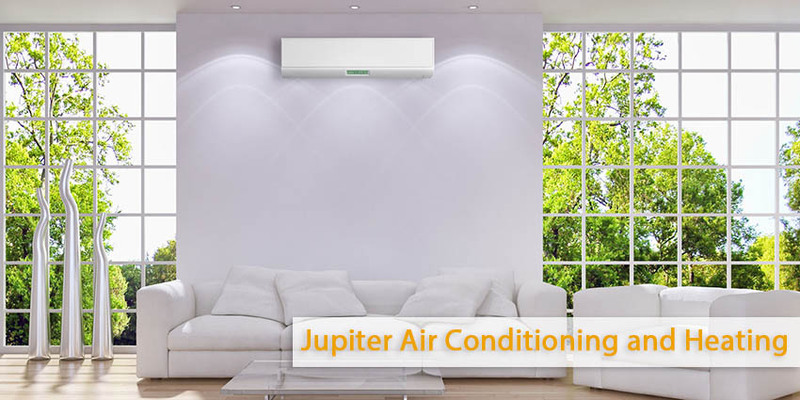 For these and other common types of air conditioning services in Los Angeles, you can depend upon the experts at Jupiter Air Conditioning and Heating. Air conditioning services don’t come more reliable, so give us a call today!